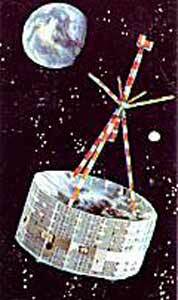 HEOS 1 (Highly Eccentric Orbit Satellite) was an earth-orbiting, spin-stabilized satellite that was launched by ESA. It was basically cylindrical with an axial boom supporting the antennas and the magnetometers. The spin-axis attitude and spin rate were changed by onboard gas jets. The spacecraft objectives were to study interplanetary magnetic fields, cosmic rays, the solar wind, and the magnetosheath. The spacecraft operation was fully satisfactory for 16 months, after which intermittent loss of some solar gate pulses (attitude reference) occurred. By 1974, spacecraft telemetry coverage was 50% and only the magnetic field experiment was operational. The spacecraft reentered the earth's atmosphere on 28 October 1975. HEOS 2 was a spin-stabilized spacecraft with a highly eccentric orbit whose apogee occurred at high latitude. Its primary scientific mission was the investigation of interplanetary space and the high-latitude magnetosphere and its boundary in the region around the northern neutral point. HEOS 2 provided new data on the sources and acceleration mechanisms of particles found in the trapped radiation belts and in the polar precipitation regions and auroral zones. It also monitored solar activity and cosmic radiation. The satellite carried a magnetometer and particle detectors which covered a broad range from thermal to cosmic-ray energies. The satellite had three antennas to study extreme low frequency (ELF) waves and carried a sensitive micrometeorite detector. The spacecraft functioned normally until it reentered the earth's atmosphere on 5 August 1974. Electron and Proton Measurements (20 eV - 50 keV. Solar Wind Measurements (230 eV-16 keV.